When we say real-time, we mean real-time! Mobile applications are in high demand in the world today. That’s why we developed mobile applications for Apple iOS and Android systems, which you can download for free. How did our system help you? "After the implementation of the system, we were expecting a difference in consumption, but the real numbers were a very pleasant surprise. For second consecutive month we saved around 26% just on fuel alone." We’ve managed to optimize gpsMonitor unit FM1100, so that the difference between reality and the location displayed on monitor is only about 5 seconds. 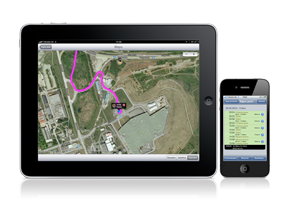 "When we found our vehicle thanks to gpsMonitor, it was a great feeling. But we were shocked to find out, that we lost goods worth almost 30,000 Eur, that were no longer in the vehicle when we found it. To transfer the data from our monitoring devices we use gsm network packet service.